When we ask brides about the one thing they weren’t expecting when it came time to ordering their invitations, the most poplar answer by far is how many choices there are. “Overwhelming” is, well, overwhelmingly how they describe it. 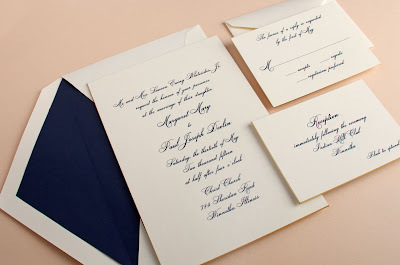 Even with the most traditional of designs, this can be the case, as it was with bride Margaret’s classic ecru invitations with a romantic navy script. “I had no idea that there are about 15 different shades of navy,” she said. Luckily, she was in good hands with the wedding stationery experts at Yellow Bird in Wilmette, Illinois. Having a stationer with experience is so important—after all, this is one of the biggest events of a couple’s life. Here, Margaret shares how small details made her traditional invitation truly unique and why brides shouldn’t be shy about asking for their stationer’s opinion. 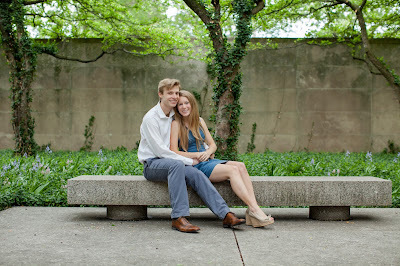 Paul and I met while we were both at Northwestern for undergrad. We had both been really active in Greek life and ended up being on the same intramural dodgeball team. We got along really well and one thing led to another! For our proposal, he had it all planned out to go to the same restaurant that we went to on our first date. It was incredibly thoughtful and romantic but not over the top, which was perfect. We didn’t have anything really specific in mind—the first appointment was a little overwhelming because there were so many options, but we were able to finally narrow down our preferences enough to find an invitation suite that we really loved. It has a lot of beautiful small detailing like the navy ink and gold edging, and the overall effect is very elegant and timeless. It was important to us that the style and tone of the invitation suite mirrored what guests could expect for the rest of the wedding, creating a cohesive aesthetic. We are having a very traditional religious ceremony and black tie optional reception, so we went with an invitation style that we felt was in line with that and really set the tone for what guests could expect from our ceremony and reception. 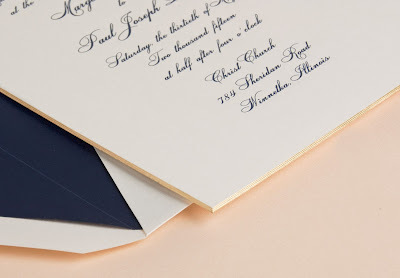 I loved the small details that really add something unique to the overall style—the navy ink and envelope liner instead of black, the gold edging on all the components and the heavy ecru stock all added touches of elegance. Was there anything about the process of choosing your invitations that you weren't expecting? I didn’t realize that there are so many different things you can choose. Beyond the basics of the paper, ink and lettering style, there are thousands of different combinations. Cindy did a great job helping us focus on one thing at a time—first the paper, then the wording, then the font style, then the extras like the edging and ink color. This approach made it much more manageable to track the series of decisions around the invitation. There are so many options! I had no idea that there are about 15 different shades of navy, and when it came to choosing an ink color it was really surprising to have so many options. Don’t be afraid to be decisive and go with what you think looks best. You should certainly consider your options, but I think that at a certain point you just need to make some decisions trust your gut. It will turn out beautifully! Also don’t be afraid to ask your stationer for their opinions, too, since they are professionals and see many, many invitations. What moment are you looking forward to the most on your wedding day?I was really looking forward to the ceremony overall—I knew it would be beautiful and really, really special. We chose the readings and music carefully so that they were within the traditional parameters for the ceremony, but were also meaningful for us as we started our new life and partnership together. It was wonderful to share such a meaningful time with family and friends that we love. Are you a bride or stationer who would like to feature your William Arthur or Vera Wang wedding invitation? Email us at concierge@crane.com!